It is always my contention that the Vietnamese (particularly in the Central and Southern regions) are a particularly religious people, and take their religion very seriously. I also think it's interesting that Catholicism is, in fact, quite an antique spiritual tradition in Vietnam. Many assume that it arrived with the French in the 19th Century, but in fact there have been Catholics in Vietnam since the beginning of the 16th Century. In the section of Ho Chi Minh City that I call home, vast numbers of Catholics reside, most of them descendants of Northern Catholics who fled the great persecutions of the mid 50s. There is a network of churches in the district, some of them, like the beautiful Ba Chuong church on Le Van Sy, quite enormous. It is inside the Ba Chuong church that you can see a shrine to St. Andrew Dung Lac and his martyred companions. At various times throughout Vietnamese history the people in charge have been less than enthusiastic about Catholicism, and there are large numbers of martyrs. 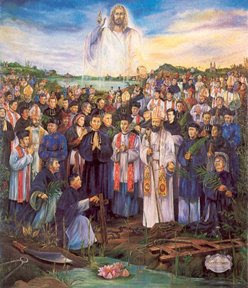 St. Andrew Dung-Lac is kind of the granddaddy of them all, and his feast day serves as the memorial date for 117 of the 19th century Catholic martyrs in Vietnam. Though a shrine to these martyrs is a standard part of most church interiors, in terms of popular devotion they can't compete with Truong Buu Diep, St. Martin de Porres and, naturally, the Blessed Virgin. Shrines to these figures are ubiquitous, and more spontaneously attended. I have a friend from Vietnam who has recently become Catholic and I want to buy him a statue or picture of the Vietnamese martyrs for his home. I can't find one anywhere. Any suggestions? Well, easy to buy in Vietnam, but not-so-easy anywhere else. Gift shops in Vietnamese areas in most large Western cities will often have statues of Our Lady of La Vang, which would be just as acceptable. My brother Andrew was traveling in Vietnam in 2009 and died suddenly of a pulmonary embolism at age 37. After a long ordeal we were able to bring him home for his burial. At the Mass the priest said he had discovered that that very day was the Feast of St. Andrew. We were all taken aback because Andy and St. Andrew shared the same name. But then the priest said that St. Andrew was a Vietnamese martyr and we were stunned! My brother Andrew died in Vietnam and was buried on the same day as the Feast of St. Andrew of Vietnam...mysterious ways indeed!